He loves nothing more than playing on his Xbox or hanging out with his friends – but teenager Mason Kettley is about to make UK medical history. The 15-year-old from Sussex will today begin revolutionary proton beam therapy on a brain tumour at the first NHS hospital to offer the treatment. Hailed as a game-changer in treating cancers where conventional radiotherapy would harm surrounding tissue – in Mason’s case risking permanent brain damage – it is eventually expected to benefit 1,500 patients a year. The £125million proton beam therapy centre is being launched at the Christie Hospital in Manchester. The Health Service has so far sent around 1,000 patients abroad for expensive proton therapy, while a private centre was opened in Wales last year. But only now can patients have the treatment on the NHS here. Mason was diagnosed in October after his mother Cally Baker, 38, had spent years asking doctors why he wasn’t getting taller or putting on weight. An MRI scan eventually revealed the slow-growing tumour. Until then the science- loving teenager, who now wants to work as a cancer doctor when he grows up, said his only symptoms were ‘headaches and stomach pains and usual things’. Mason, who also lives with his stepfather Ryan Baker, 34, an airport firefighter, and four siblings in Angmering, West Sussex, will have to miss six weeks of school while he undergoes the treatment 250 miles from home. He will be at the Christie five days a week having his tumour bombarded with high-energy protons generated by a 90-tonne machine called a cyclotron. His tumour – known as a benign pilomyxoid astrocytoma – could not be operated on due to the risk of causing blindness. 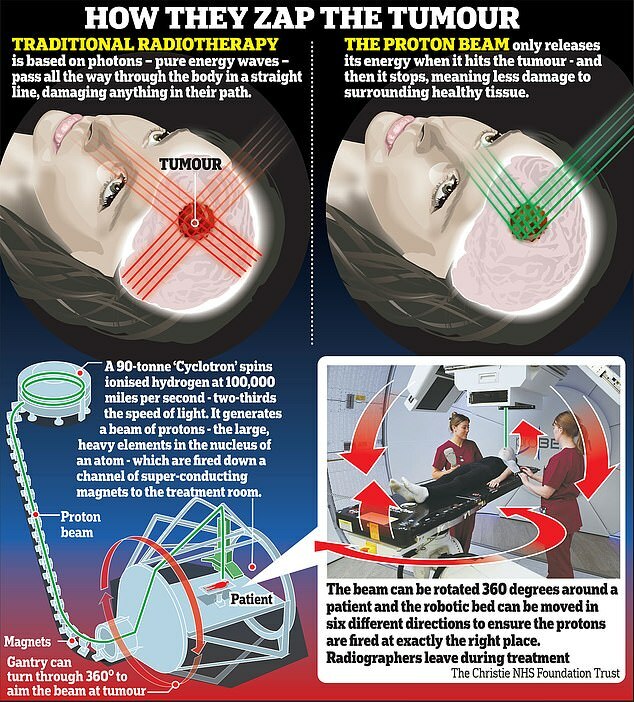 But it is hoped proton therapy can stabilise and potentially shrink the tumour without damaging vital brain tissue. During the therapy, protons are beamed into the tumour with pinpoint accuracy for a few seconds each day. Mason’s mother told yesterday of the family’s battle to have him diagnosed. In June last year she took Mason to a new GP after moving from Crawley, West Sussex, because of his headaches and blurred sight. He was referred to a paediatrician – but it was only in October that he underwent a brain scan. ‘They’d found something that shouldn’t be there, so we thought the next step would be to remove it,’ Mrs Baker said. ‘It was only after the biopsy that they said it would be too dangerous to operate.’ But Mason’s consultant told them he was an ideal candidate for proton beam therapy and they began preparing for the treatment. It comes just over four years after the story of Ashya King, who was then five, sparked a fierce debate. His parents caused a manhunt when they took him to Spain, fearing the radiotherapy recommended by doctors in Southampton treating his brain tumour would turn him into ‘a vegetable’.